We think accreditations are really important. Nothing gives customers more confidence than having trustworthy third parties acknowledging your expertise. Having the right accreditations in place means a firm takes what they do seriously and wants to continue to strive for excellence. Here at Ultra Cleaning Service we proudly stand by that. Our list of accreditations is long and includes being ‘’Safe Contractor Approved’’, having ‘’IOSH’’ accreditation and being a member of the ‘’Federation of Window Cleaners’’. We’re also absolutely delighted to announce that we have achieved ‘’CHAS’’ accreditation again too! ‘’CHAS’’ accreditation ensures that our health and safety compliance is at the heart of everything we do. It’s an accreditation that we’re very proud of. ‘’CHAS’’ is integral to what we do and provides our clients with complete peace of mind that we’re able to comply with all the latest health and safety legislation. Did you know we once cleaned the windows at Manchester Town Hall in preparation for the Queens visit? Being honoured with prestigious work like that, we’ve enjoyed a great working relationship over the years with Manchester City Council. The market for cleaning contracts is getting more and more competitive, however we’re pleased to share the news that Manchester City Council have secured our continued services with an extended contract. We’ll be maintaining the windows of buildings like the Town Hall and the Central Library. 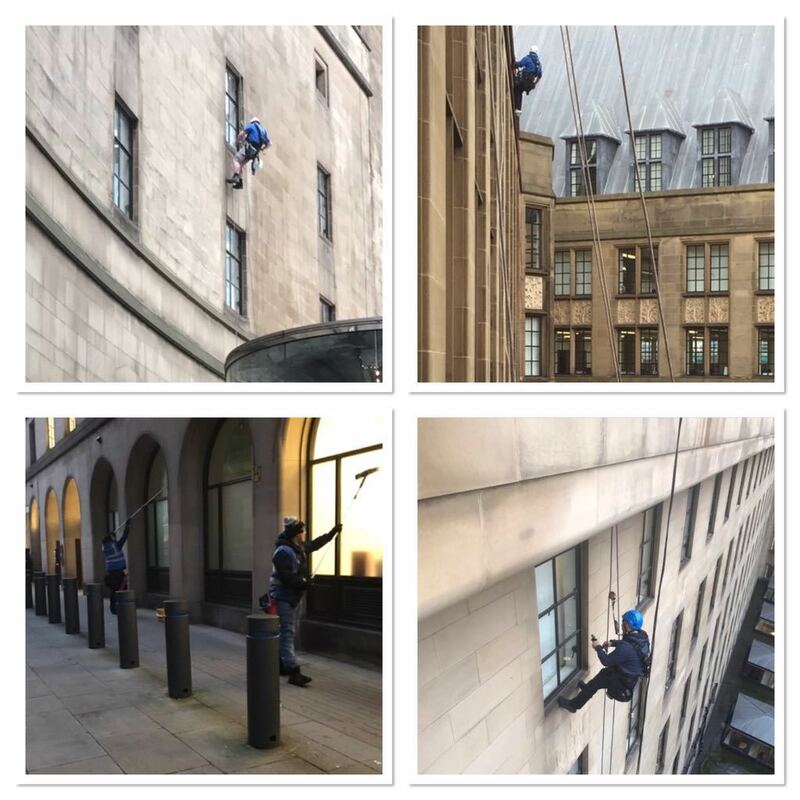 Delivering expert services including reach and wash and rope access window cleaning, we can’t wait to carry on doing our bit to ensure the City looks as good as it possibly can. Especially with the influx of tourists during, what will hopefully be, beautiful Summer weather! We’ve Won 11 New Student Accommodation Sites! A job well done is always what we aim for at Ultra Cleaning Service. Leaving our clients with perfectly cleaned premises gives us a great sense of satisfaction. We were thrilled to win a large contract recently; purely off the back of a previously completed project for a large, national, facilities company. Impressed with our work and competitive pricing, this large facilities management firm has instructed us to complete cleaning work on 11 student accommodation sites; 6 in Liverpool, 3 in Manchester and 2 in Sheffield. This is an exciting project that further demonstrates the quality of our service offering and the diversity of our commercial window cleaning solutions. If you’d like to learn more about any of our commercial window cleaning services, you can click here.